The best! I’ve read just about everything that ever interested me just tons of subjects and genres. To be a good writer I think you need a vast amount of resources to draw in creating, and those resources should create a synthesis in the writer and when you’re ready to write that synthesis will create something novel. I’ve been writing since I was about 13, everything from journals, to stories, to philosophy, poetry, just about everything I’ve ever read I’ve tried to write in that style or discipline. My biggest influence would have to be Kerouac. He taught me to just write, let the words flow, not to worry about meaning but more of getting the feeling down. Kerouac was also good for showing me that poetry can be incorporated into fiction. Poetry was my first impetus and my first novel “Becoming Angel” is rife with the poems I had written up until that time and I was able to incorporate them. “The Last Stage” also has some nice poetic images and I think the use of poetic images in “The Last Stage” is a little more nuanced. How has music influenced your writing? A lot. As a subject it has given me a lot of experience and insight into people because of the dramatic, raw experience of rock ‘n’ roll. I wrote in The Last Stage rock ‘n’ roll is a stark theatre. In my writing I’ve used themes I found in music and tried to recreate them in stories. And in the very utilitarian sense I usually write while listening to music, it helps with the rhythms and flow of the writing. I think the biggest accomplishment is writing the books, and then getting them to come out as I’ve pictured them in my mind. Life is my research. For any writer experience is the raw material. I’m not just talking about using your life experiences as a roman a clef, but in finding out how people react in certain situations, what they think about, their characteristics, and of course you can find yourself in a situation that is a take off point for a story. The more you experience the more you can bring to the writing, the more real and less contrived the situations in your writing will seem. Jim Morrison was often thought of as a magical poet, what are your thoughts on that? I kind of don’t understand it. I think Morrison is underestimated as a poet his “An American Prayer” is just about at the same level as Allen Ginsberg’s “Howl.” Morrison created some of his most stunning images in poetry when he was only 21 it’s amazing that he could write something like “the car all stuffed with eyes” I wish I could have had that kind of versatility with words at 21. I think Morrison also had a philosophy or a mythos worked out in his approach to writing and he followed it. At that age I was still struggling to find that in my writing. You write a column for the Examiner about The Doors, where can we find it and can you tell us a bit more about it? The Doors Examiner (http://www.examiner.com/the-doors-in-national/jim-cherry) are articles that keep people abreast of things that are happening with The Doors such as Jim Morrison’s recent pardon in Florida. I also do articles on Doors history. I’ve also delved into The Doors as a social phenomena with articles on the use of Doors music in film. There have also been a lot of books and CD’s coming out about The Doors or include sections of a book on The Doors so I do a lot of reviews and articles on them. In short I write articles on any aspect of the band that I think is of interest to fans. As kind of a supplement I’ve recently started a The Doors Examiner blog (http://www.thedoorsexaminerblog.blogspot.com/) that looks back over old articles that still are relevant or I think are interesting and readers will like. You also conduct reviews on books, how do you feel that is different compared to the writing experience? Writing is writing to me. Writing no matter what type it is just finding the right word or combination of words to convey an idea or feeling. When I write reviews besides giving the basic facts of what’s being reviewed I try to give the reader a feeling for what’s being reviewed. Can you tell us a little bit about "The Last Stage?" “The Last Stage” is about a loner Michael Desmond, who has not been able to find life after college, so he never left the college town but he finds himself adrift, but he also knows that there’s something in him that was meant for something greater and that urge pushes him to seek out a destiny. Throughout his life people have remarked on his resemblance to Jim Morrison and that provides him with some direction and he starts a Doors tribute band and they go out on tour becoming some what successful but Michael starts discovering things about himself some of which are on the dark side as he lets ambition be his guide. Since The Doors and Jim Morrison is Michael’s model there is a lot of Doors history and lore in it. All The Doors make fictional cameo’s in the book including Jim Morrison. What made you want to write a fiction book based on The Doors? It started basically with the image I use in the first chapter of the book, a guy sitting in front of a mirror thinking back on his life and trying to figure out how he got to where he is. I had a lot of ideas of what was going to happen in the book and The Doors seemed an ideal group to frame those ideas and themes around. Where can we find "The Last Stage "? Rumor has it there is a comic being created based on "The Last Stage", is the rumor true and if so can you tell us about it? Yes, right now I’m working with an artist (Daniel Gise, some of Daniel‘s drawings are on The Last Stage Facebook fanpage http://www.facebook.com/pages/The-Last-StageJymsbooks/265129363561?v=wall) to turn The Last Stage into a graphic novel. Right now we have the book with an editor and we’re hoping to hear from him before the end of the month or early in the new year. Who was responsible for the cover/book design of your book? Rickey Mallory, she’s a talented artist that has a real feel for book covers. 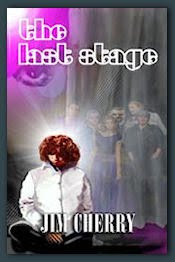 I think if I saw the cover of “The Last Stage” in a book store I would buy it just for that. Why did you decide to self publish instead? The mainstream publishing industry decided that for me. I tried many agents and publishers and while I had some nibbles and near misses nothing panned out. So, I decided that if I could show the agents and publishers that there was an audience for writing they would see the possibilities for the mass audience and would want to publish my books. I enjoy doing them, and talking to people about my work. I think the most unusual one was a radio interviewer who was also a stand-up comic and he had an idea of a time traveling clown who goes back to Woodstock. The deal was that I would write the whole novel and we would split the money 50-50. I want to release a book of my reviews. I’ve been working on reviewing for about 2 years and have become a top rated reviewer on Amazon, and I think the reviews are pretty good so I’d like to bring them together in a book. I’m also working on a screenplay and when I finish in early 2011 I’d like to put it in a book with the other 2 screenplays I have written, I’m thinking of the title My Movie Mind. Not the immediate future, no. But if anybody out there would like to do have an event or book signing I’d be glad to participate. I’ve done had traditional book signings and I’ve even participated in a Karaoke Night book signing so I’m game for anything! I don’t know, I think if I had the answer to that I would be right up in sales with Stephen King or John Grisham. The best thing to do is write the best you can and do your research about an agent or publisher before you approach them, make sure they handle your kind of writing. There are a lot of places I’m at online Twitter (www.twitter.com/DoorsExaminer), The Last Stage Facebook fanpage (http://www.facebook.com/pages/The-Last-StageJymsbooks/265129363561?v=wall), you can subscribe to my newsletter at Jymsbooks (www.jymsbooks.com), those are the best places to find me.